Great champions in sports, business and even families have one thing in common. It’s a legitimate secret weapon. It is something that lies deep in the genetic code of winning organizations. It appears when pressure is high, when the stakes are critical and when everything is on the line. They know how to work as a team. 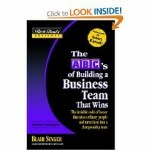 Blair Singer’s The ABC’s of Building a Business Team That Wins offers a set of simple, powerful rules that govern the internal behaviours of any business, organization, family or individual. They are rules like ‘Never abandon a teammate in need’, ‘Be personally responsible for all mistakes’ and ‘Be on time’. This book will step you through the process so that you can create championship results any time, any place.